Life on the road as a professional tennis player can be tough, even more so when injuries hamper your chances of progressing up the rankings. 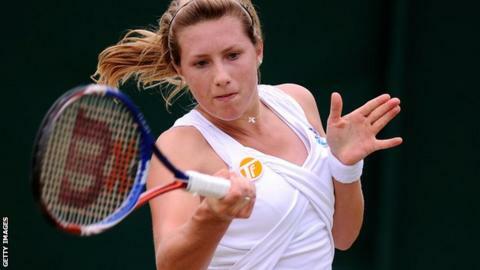 British number 23 Lucy Brown, who is ranked 927th in the world, has felt the cost both financially and emotionally. The 22-year-old, from Oxford, has turned to crowdfunding in a bid to reach the main Wimbledon women's draw. "A couple of my friends have done it and it's been really successful for them," she told BBC Radio Oxford. "Money they've raised has helped them go to lots of tournaments and in different sports it's proved successful too. "I set mine up as even though I wasn't playing at tournaments through injury, I still had costs of training, travelling and rehabilitation to contend with." Crowdfunding is a way of asking people to invest money in businesses or projects. More than nine million investments and donations were made last year in this way. Brown will use the money pledged to her by a combination of friends, tennis fans and business backers to try to secure one of two Wimbledon wildcards up for grabs from Thursday. She will line up in play-off at Aorangi Park in the shadows of the famous SW19 courts. Three wins on Thursday and Friday would ensure she can put her feet up for another week and avoid entering the main qualifying tournament in Roehampton. Brown is no stranger to Wimbledon, having competed in the junior singles and doubles draws as recently as 2011, but recently injuries have hampered her progress. "It would be great to be back there, playing in front of a home crowd," she added. "It's just such a great atmosphere that really makes you want to win. "But there's a lot of young British girls coming through at the moment keen to beat us older ones, so it's tough going."